We sometimes underestimate the power of encouragement. So many times one act of kindness, or one word of encouragement, can change a life forever. Encouragement can come in the form of a kind word, deed, or written note that has the power to change a life forever. 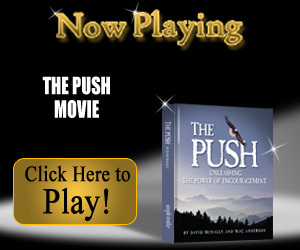 Enjoy watching the movie, The Push, for a message of encouragement that can push your life from ordinary to extraordinary. 1. You can do it! 2. Don’t take NO personal. 3. Failure is one step closer to success. 4. If you believe you can’t, then you never will. 5. Can’t is NOT a word. 6. Adversities are nothing more than a challenge to overcome. 7. There is always an answer. 8. Your thoughts can become things. 9. Keep on keeping on. 10. Leverage is your best friend. 11. Be a master of one. 12. Fear is NOT real. 13. Be present in what you do. 14. Make an impact, make a difference. 15. Raise like minded people up. 16. Integrity is an integral quality a leader has. 17. Improve yourself 0.3% each day and in one you will have improved by 100%. 18. Leaders are not born, they are made. 19. Losers are winners in the making. 20. Success is a lifestyle. 21. Good in, good out. 22. Nothing can distract you from a burning desire. 23. Your words have a profound effect on people. 24. Smile and laugh once in a while. 25. Be grateful for all you have. Let’s see if we can get this list over 50. Do you have any you’d like to add?